Valencia Oranges are the summertime classics of the citrus world. Mostly known for their high volume of sweet tangy juice, they are also great as an eating orange. Yes, Valencias do contain some seeds, but it's a small price to pay for tree ripened citrus fruit in the summer months. So, grow your own and juice your own oranges for delicious flavor and great health. 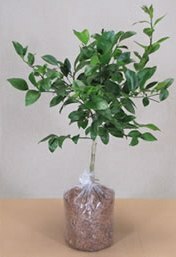 As a tree, these are both great grown indoors in containers or outside in full sun.